General Awareness is a source for good preparation of Bank, SSC CGL, UPSC, and railway and for other competitive exams. 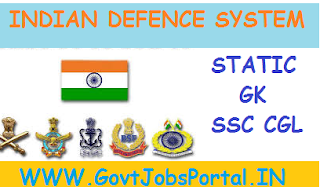 Study General Awareness from www.GovtJobsPortal.in and stay updated as well as prepare for General Awareness section which is asked in SSC CGL, UPSC and other competitive exams. Here we are providing static GK for SSC CGL exam. Today’s topic on static GK is INDIAN DEFENCE. The president of India is the supreme commander of the Indian Defence System. The whole administrative control of the Armed forces lies in the Ministry of Defence. 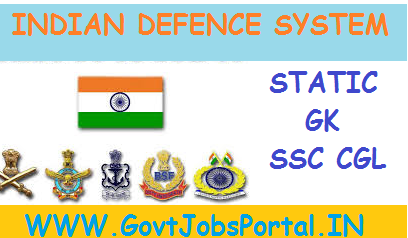 Indian Defence System has been divided into three services – Army, Navy and Air force. We will discuss one by one all these services: Indian Army, Navy and Air force. Each command is under a General Officer Commanding-in-chief of the rank of Lieutenant General. The commands are divided into Areas and Sub-Areas. An area is commanded by a General Officer Commanding of the rank of a Major General and a sub-area by a Brigadier. · Each command is headed by Vice Admiral. · The Navy is headed by the ‘’Chief of the Naval Staff” of the rank of Admiral. · The first Aircraft Carrier of Indian Navy was INS Vikrant. India’s largest Aircraft carrier is INS Viraat . After retirement of Vikrant, Viraat is the main guard of Indian coastline. It was commissioned in 1987 and will continue is service till 2010. · INS chakra was India’s first nuclear submarine. · INS Vibhuti was India’s first indigenously built missile boat launched at Mazgaon docks in Mumbai. · INS Savitri was India’s first warship fabricated at Hindustan Shipyard Limited in 1990. · INS Shakti was India’s first indigenously built submarine. · INS Delhi is India’s largest and most sophisticated indigenously built worship. It was launched in 1991 at Mazgaon docks and commissioned in 1997. · INS Kadamba is India’s largest naval base situated at Darwar, Karwar, Karnataka. It was commissioned in 2005 under the project ‘Seabird’. · INS Talwar is firt of the three high-tech stealth frigates built by Russia for Indian navy. · INS Prahar is world’s fastest missile ship, commissioned in 1997. · INS Mysore is Indian navy’s most modernised indigenously built warship, commissioned in 1999. · INS Beas, the advanced guided missile frigate, was commissioned in 2005. · INS Arihant, the indigenous nuclear-powered submarine , was symbolically launched in 2009. · INS Chakra-II is the Akula class submarine, acquired from Russia in 2012. · INS Tarkash: the second of the Russian-built Talwar class stealth frigates – INS Tarkash – equipped with supersonic curise missiles was commissioned into the Navy at the Yantar Shipyard in Russia on Nov 9, 2012. · INS Teg Frigate: The Indian navy inducted newly-built INS Teg in its fleet at the Yantar shipyard in Russia’s Kaliningrad on April 27. · INS Sahyadri: Indigenously built stealth warship ‘INS Sahyadri’ was commissioned on July 21, 2012 in the Indian Navy, adding firepower to its anti-submarine warfare capabilities. The frigate is the last in series of stealth warships after ‘INS Shivalik’ and ‘INS Satpura’, the first two in the class- INS Shivalik and INS Satpura – were commissioned in Apri 2010 and August 2011, respectively. · INS Dweeprakshak: As part of its efforts to augment the security of the strategically significant Lakshadweep archipelago, the navy commissioned a full-scale naval base, INS dweeprakash, at Kaavaratti on April 30, 2012.